Anju Sharma is the proud mother of three wonderful children, an entrepreneur and a dedicated community volunteer. Anju received her master’s degree in Political Science. Sharma is a high-level planner and strategic account manager for multiple successful large and small businesses and corporations. She has a reputation for being fair-minded and at the same time she has demonstrated an ability to create positive and successful business initiatives. Anju Sharma is a candidate for the legislative assembly to help restore investor confidence in our province, and to foster an economic environment in which our small businesses can succeed and thrive. Sharma is passionate on a range of social issues including education, health care and meeting our need for affordable housing. One of the driving forces behind Anju’s candidacy is to remove any and all barriers which stand in the way of women achieving their rightful place in Albertan society as citizens that share full social and political equality. Further, as a mother, Anju is aware keenly of the pressures that families face in this uncertain economic climate. For these Albertans, Anju seeks to give hope and take the necessary actions to create a better Alberta for all. Anju is driven to help and support our province’s aging population. Anju understands that the needs of our senior citizens have too often been neglected. And, as the size of our senior population increases, so does the need for government support for senior services. Sharma is dedicated, not only to advocate on behalf of our seniors, but is prepared to legislate those measures which will ensure economic, health care and housing security for all our seniors as a duty of government and a right guaranteed to our seniors. And, Anju takes this responsibility most seriously. Anju comes from a family that believes in the value of hard work and understands the value of a dollar. Like all the hard-working people of Edmonton-Mill Woods, she strongly supports prudent and responsible spending decisions that will permit us to meet Alberta’s needs, while restraining ill-advised ventures that would push Alberta further into debt. Her philosophy - that the future of our communities is at stake when we ignore the balance between taxation and spending - is a message she wants to bring to the Legislative Assembly. And therefore, intelligent and responsible financial planning is at the heart of her campaign. Anju Sharma is a proud Albertan and Canadian. And, recognizes that the work of government must be taken on by honorable people and conducted with the upmost integrity. Anju is a product of the proud and noble heritage of India, and bitter experience has taught her what can happen when any government is not held accountable for its actions fully. 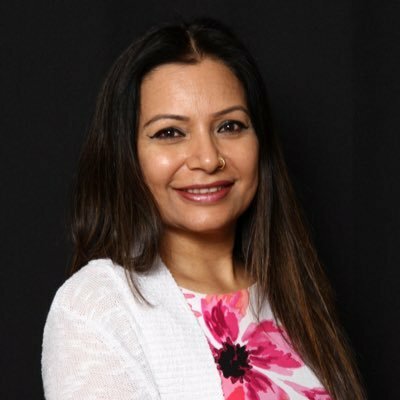 Anju Sharma is dedicated to bringing informed, timely and honest representation to the people of Edmonton-Mill Woods. Join us, and help elect Anju Sharma as our MLA from Edmonton-Mill Woods.